Elbows are connecting items that attach to downspouts, downpipes, and leaders. They redirect the downspout either along the wall or towards/away from the wall. Elbows typically change the direction of their connector pieces by 72 degrees. Custom degrees are available for plain square and square corrugated elbows. Creator Elbows maintain a traditional box-styled shape. They are an endurance-manufactured part, fabricated with the highest grade metal materials to ensure that they last for a long time to come. Creator Elbows attach to the downspout to “spout” and divert the rainwater away from the structure. In certain situations, it may be worthwhile to irrigate a small ditch to further capture the water and keep it from pooling. Plain Square Elbow – A1 maintain a seam on the back of the piece. They are responsible for running water away from the building as well as accepting a leader or elbow that is channeled away from the building. Plain Square Elbow – A2 contain the same functional aspects as A1 elbows, however the seam is asymmetrical — being on the opposite side. The distinction is a matter of preference or catered to specific job requirements. As a general rule, A2 pieces are less frequently employed than its A1 counterpart. Plain Square Elbow – B are chargeable for hugging the wall to run the leader across the building. The difference between the B Style and A1/A2 elbows, is mostly related to the positioning of the seam as well as the desired direction for channeling. Plain Square Elbows is very customizable and available in almost any size. This Plain Square Elbow is a smoothly surfaced hand fabricated elbow that comes standard at 45 degrees, but can be customized to your specifications. They are typically made in copper but are also available in lead coated copper, stainless steel, galvanized, baked enamel & Kynar. 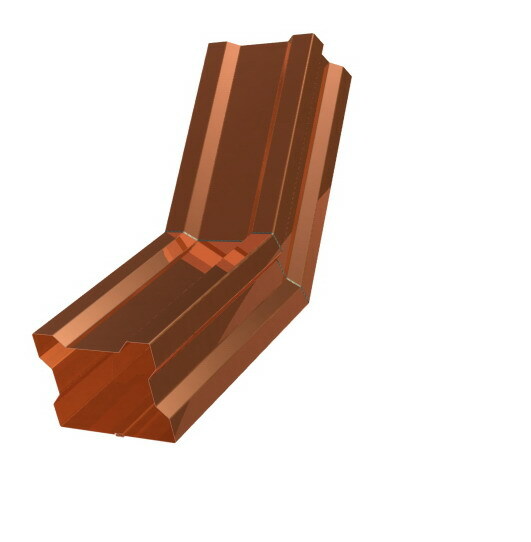 Generally, these elbows are heavy gauge and used for commercial projects. Elbows are available in 30, 45, 60, 75, and 90 degree bends. 75 degree elbows are considered standard in the industry. We can custom fabricate any elbow design for both commercial and residential applications. Please specify in your order the degree of your elbow. Need it to be custom? please call us at 718-433-2501. Quintet Elbows help to connect the downspout to the rest of the drainage system. Our elbows are angled to carry the water away from the structure with efficiency and endurance. 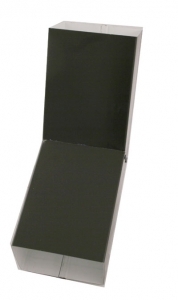 Our downspout elbows can be fabricated in several different material options, which can be viewed by scrolling down using our merchandising system. Quintet Elbows help to complete the rainwater drainage system with a part that will outlast the home. We stand behind our products, and with the standard angle bend that helps to spout the water removal of the entire gutter system. When installed tight to the gutters, these elbows help to direct the water away from the structure and out of harm’s way. 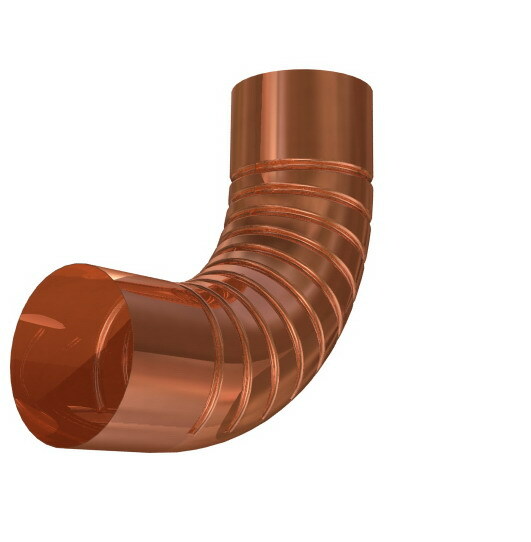 Round Corrugated Elbows are fabricated to attach and match to a corrugated styled gutter system and/or leader. The angle and bend of the design is standard but the quality and function of the part are top rate. The Round Corrugated Downspout matches our very own stylish and contemporary looking and feeling round corrugated downspout. With continuity of design and faithful commitment to purpose, our roofing products will outshine and outwork the competition. Choose from a variety of material applications all with an equal commitment to quality performance. 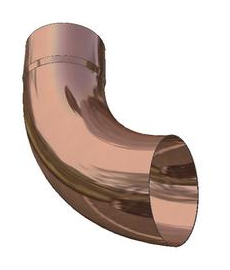 Round Seamless Copper Elbows are copper elbows that are laser welded, providing superficial quality to the exterior. These pieces can be spun in any direction. 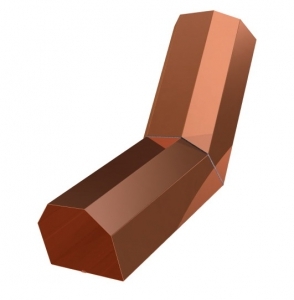 A Round Seamless Elbow is fabricated from the finest quality copper. This seemingly perfect piece is laser welded which ensures an appealing exterior and can be spun in any direction. It is available in 3 inch or 4 inch 20 ounce copper. These are the finest quality elbows on the market and are surprisingly affordable! Square Corrugated A Elbows are used to run water away from or toward the wall. Square Corrugated A Elbows are very economical elbows because they are machine made. 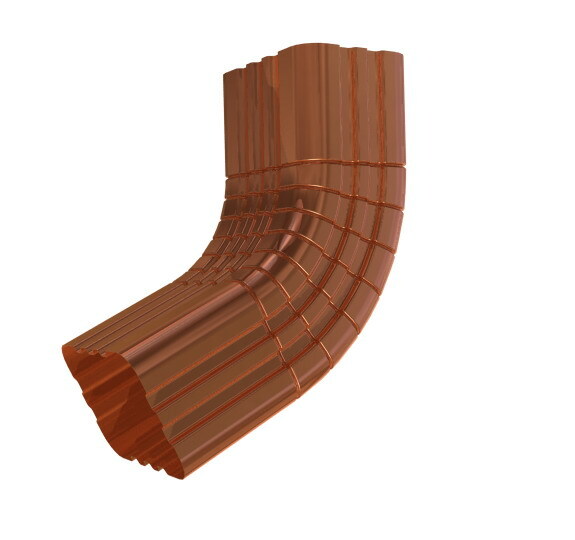 Square Corrugated B Elbows are used to run water across or along the wall. A Square Corrugated B Elbow is responsible for channeling water in a direction parallel to the face of the structure. Our material selections, include: baked enamel, lead coated copper, and copper. Price out your next jon using our patent-pending pricing vehicle. B&B: on top of the game.If this product doesn’t meet your needs, take a look at the rest of our line of elbows. One is sure to meet your needs!